A place of unspoiled scenic wonders, Wyoming is the place where the Rocky Mountains meet the Great Plains. On the Continental Divide, some of Wyoming’s rivers flow east to the Missouri River watershed while others flow west to the Colorado River, Columbia River, and Great Salt Lake watersheds. Yellowstone Lake and Jackson Lake are two of the nation’s largest natural high-elevation lakes. Three of Wyoming’s largest artificial lakes are the Flaming Gorge, Pathfinder, and Seminoe Reservoirs. Less than 1% of the state (about 710 square miles) is covered by water. What is Wyoming’s maritime heritage? People moved into Wyoming beginning at the end of the last Ice Age more than 10,000 years ago. The earliest people, Paleo-Indians, were nomadic hunters and gatherers while people from later time periods made more intensive use of the lakes and rivers. John Colter, a member of the Lewis and Clark Expedition, is thought to be the first Euro-American to view Yellowstone Lake during his explorations of northwestern Wyoming in the winter of 1807-1808. Trappers began arriving in Wyoming in the 1810s and, by the 1820s, they were transporting buffalo and beaver skins in rafts, bullboats, and mackinaws down the rivers. Fur trading posts were established at strategic points along the rivers, like Fort William at the confluence of the Laramie and North Platte Rivers in 1834. Scientific expeditions like the ones led by John Charles Fremont in the 1840s and John Wesley Powell in the 1860s and 1870s explored and mapped portions of Wyoming. Thousands of emigrants passed through Wyoming from the 1840s to 1860s following the Emigrant Trail, the Bozeman Trail, and the Bridger Trail. Military forts and more trading posts were established along the trails to protect emigrants from Indian attack and to resupply and ferry them across rivers on their travels west. After Yellowstone National Park was established in 1872, a boating industry developed to transport people and supplies to resorts and provide tours around the lakes. 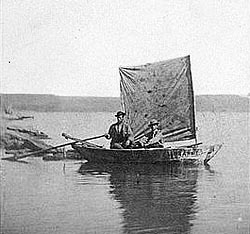 Rowboats and sailboats plied Yellowstone Lake in the 1870s and 1880s, and steamboat service began in the 1890s. Lake boat touring declined around 1916 with the advent of automobile touring. Wyoming’s rivers and lakes are thought to contain the wrecks of many boats from the rafts and small boats lost by trappers and explorers to tour boats lost in modern times. Wyoming’s artificial lakes also contain shipwrecks as well as ruins of prehistoric and historic sites and towns that became inundated when the reservoirs were filled with water. This includes the town of Kane, founded in 1895 and site of the Kane Ferry, now covered by Bighorn Lake created by the Yellowtail Dam. A number of submerged sites in Yellowstone Lake are associated with the tourist trade and the Lake Hotel which opened for business in 1891. The sites include small rowboats, a boathouse and dock structures, and a fish hatchery. The remains of the E.C. 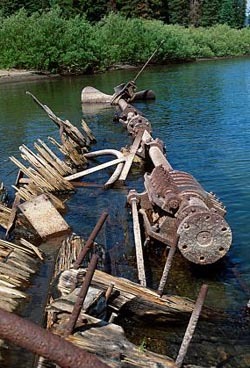 Waters, a steamer brought to the lake in 1905 but never used, are partially exposed on the shores of Stevenson Island. In 1908, the Green River Navigation Company formed to carry passengers and freight between Green River, Wyoming, and Linwood, Utah. The steamboat Comet, constructed in a boatyard in Green River, made several trips but passing over the sandbars proved too difficult, the service was terminated, and the vessel was abandoned. Its hulk is reported to be about 300 yards below the Wyoming Highway 530 Bridge in Green River. Who takes care of Wyoming's underwater archeological sites? The Office of the Wyoming State Archaeologist conducts archeological research and survey of the state and manages the state’s archeological repository. The State Archaeologist is part of the Cultural Resources Division in the Wyoming Department of State Parks and Cultural Resources, and is affiliated with the Department of Anthropology at the University of Wyoming. The Wyoming State Historic Preservation Office, also part of the Cultural Resources Division, promotes the preservation of the state’s cultural resources including its archeological sites. The Division of State Parks, Historic Sites and Trails manages archeological sites located in state parks, at state historic sites, and along state trails. The State Board of Land Commissioners issues permits for archeological investigations on state lands. The Federal Government takes care of many archeological sites in Wyoming because it holds about one-half of the land in the state. This includes public and Indian land managed by the Bureau of Indian Affairs and the respective Indian tribes, the Bureau of Land Management, the Bureau of Reclamation, the Fish and Wildlife Service, the Forest Service, the National Park Service, and the Department of Defense. You need authorization from the State Board of Land Commissioners to conduct archeological surveys and excavations on state lands in Wyoming. Requests are submitted to the Office of State Lands and Investments. You need a Permit for Archeological Investigations from the appropriate federal agency when the site is on federally owned or controlled land. Archeological materials from public lands in Wyoming are deposited for curation at the University of Wyoming Archaeological Repository. What laws concern underwater archeology in Wyoming? Wyoming’s laws about protection and management of its archeological sites are set forth in Title 36 (Public Lands) in the Wyoming Statutes. The 1935 Wyoming Antiquities Act is set forth in Sections 114 to 116 of Chapter 1. The authorities for State Parks and Cultural Resources are covered in Chapter 4. The authority for the Office of the Wyoming State Archaeologist is found in Section 106(d) of Chapter 4.